Dealing with bureaucracy is an occupational hazard of covering U.N. events  sort of like the kidnapping risk faced by war correspondents in Afghanistan, if somewhat less dramatic. So it seemed like business as usual when I arrived early Monday morning at the Bella Center in Copenhagen to pick up my badge to enter the U.N. climate-change summit. The queue snaking outside the convention center was savagely long, stretching as far as one could see, but I figured I'd spend an hour, two at most, out here in the bitter Danish cold. I nearly froze my toes off. The administrative logistics at the conference were proving as jungly as the climate negotiations themselves. What followed for us  the journalists, activists and academics who had descended on the city over the weekend to attend the second week of climate negotiations  was a six-hour ordeal of blind waiting and misinformation. At one point, those of us in the middle of the throng were told by the yellow-jacketed Danish politi that a new line had just opened up, so we rushed to the fenced entrance of the Bella Center, only to join a milling scrum that had even less direction than we did. There we stood, and stood, and stood, waiting for some sign of what might happen next. Perhaps the uncertainty outside the conference center was indicative of the events on the other side of the walls, where negotiations had entered a deep freeze. Early in the day, representatives of developing countries, including India, China and African nations, halted talks and threatened to walk out, saying that developed countries were refusing to do their part to reduce greenhouse-gas emissions. The strike was temporary  after meeting with Danish Minister Connie Hedegaard, head of the summit, negotiators from developing countries rejoined the talks  but their threat of a walkout underscored the deep divisions that remain between rich and poor nations. That gap has not diminished in the second week of the summit, during which heads of state are expected to finalize the architecture of a new climate deal. "This could be a disaster if [developing nations] decide to walk out of the negotiations," said Barry Coates, executive director of Oxfam New Zealand. "We are very concerned about this escalating." Back outside, as the hours ticked away and our extremities grew numb, bits of bureaucratic half-truths began floating through the crowd. First, we heard that the machines that print new IDs had broken down. Then we were told that it was simply taking longer than expected to process people and that those of us at the front of the queue  where I had arrived, thanks to a few well-thrown elbows  would be admitted to the conference in an hour or two. That was around 11:30 a.m. More than two hours later, I had somehow ended up traveling backward in line. A crowd that had started out in good humor began to turn ugly, drowning out nearby demonstrators' chants of "We want climate justice" with angry shouts of "Let us in!" There are two major channels of debate within the summit as well: one involving a new, longer-term climate deal and the other focusing on the future of the Kyoto Protocol, whose first phase of emission-cuts requirements ends in 2012. Poor countries' central concern is that rich nations are looking to phase out the Kyoto Protocol  which demands cuts from developed countries but asks virtually nothing of developing nations  in favor of a new pact that would redistribute the burden. Representatives of poor nations have a legitimate point. 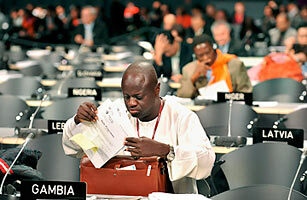 For now, the Kyoto Protocol is the only legally binding international pact with mandatory carbon-emission cuts. While developed nations, including the U.S., have already put pledges of new cuts on the table, nothing has been signed in a treaty  and it's clear that such language won't be achieved in Copenhagen, in part because the U.S. cannot fully commit to emission reductions until the Senate passes the circulating cap-and-trade bill. "We have a situation that developed where issues pertaining to Kyoto Protocol were not on the table and that led the Africa group to make a decision ... not [to] participate in any negotiations until the issues of Kyoto Protocol are discussed," Lumumba Stanislaus Di-Aping, Sudan's envoy, told reporters at the summit. But the walkout does not mean that negotiations have collapsed or, as some media report had it, are in "chaos"  at least not in any more chaos than is typical for U.N. climate talks. "This is all part of the negotiating dynamic, especially as you get close to the endgame," said Jake Schmidt, international climate-policy director for the Natural Resources Defense Council. We are fast approaching the endgame, though, and at some point the deep divisions  including how much aid developed nations will give to finance climate adaptation and how that money will be delivered  will need to be bridged. Meanwhile, the stakes could not be higher: a new tally by several climate groups showed that even if every nation made good on the carbon pledges they've put on the table so far, the amount of atmospheric carbon would still rise to a level that is well outside a climatic safe zone. The hope is that once world leaders show up this week, they can provide the political will to push through a deal  or something resembling one. As for the crowd outside the Bella Center, no amount of political will would gain us entry to the summit  at least not today. The issue was of simple capacity. There are more than 40,000 delegates, activists and journalists registered with the U.N., but the Bella Center can safely hold only about 16,000 people. You can't negotiate with a fire code, much as you can't, as environmentalists who push for sharper carbon cuts are fond of saying, negotiate with nature.